It used to be that depression was a mental disorder. If you were feeling depressed after the death in your family, that is not the disorder of clinical depression, because that is a completely normal response to circumstances. No more. 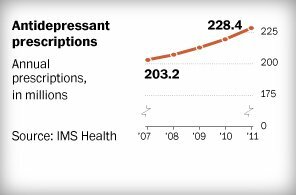 Big pharmaceutical companies have drugs for depression, and psychiatrists are only too happy to prescribe them. So they give pills to people who are mourning a death in a completely normal way. The paper gives the impression that everyone would be happy if only the committee appointed psychiatrists with integrity and without conflicts of interest. Not me. There are no psychiatrists of integrity. It is better to just admit upfront that the DSM-5 is primarily a guide for extracting money from patients, insurance companies, and govt agencies. It does not really diagnose disorders. It cannot define what a disorder is. There are no psychiatrists of integrity ? Do you know all the psychiatrists in the world ? You were able to determine this without a doubt ? Simple minded thinking again, don't you think ? I did credit a psychiatrist last month. But the whole field is corrupt.